All our Cosmetics are Handmade from Organic and Natural ingredients. We take great pride in sourcing the best ingredients available to us, we also pride ourselves in keeping our prices extremely competitive. Our Balms contain only Five ingredients including the doTerra Essential Oils. If you suffer from Dry Skin or enjoy the outdoors then our Balms are a must for you as they act as a barrier against wind, rain etc. They are also a great base for under your make-up. If you enjoy sunbathing the Balms can be used as an aftersun by soothing and moisturizing your skin leaving it silky smooth and glowing. HAND HARVESTED ORGANIC SEAWEED: Noel Lee was born and raised in Lettermullen, a beautiful windswept Island off the West Coast of Ireland. For generations, the Lee family have been hand harvesting Kelp and Seaweed off the Connemara Coast. OUR MISSION: Our mission is to provide hand harvested, sustainable, kelp and seaweed products for human consumption through health supplements and edible products. Having a positive impact on our community and our environment is at the core of all that we do. WHAT DRIVES US: We aim to provide you with sustainably harvested, local, edible seaweeds and introduce these as an alternative food source that is healthy, nutritional, tasty, and good for the environment. It is important to acknowledge the importance of seaweeds for marine life, and we need to balance this with its use by humans. We, therefore, adopt an ecosystem approach, meaning that we promote conservation and sustainable use in an equitable way. Most, if not all, the seaweeds currently for sale have travelled thousands of kilometres to reach your local supermarket and food shop, often all the way from China. Small-scale, local produce is key to a happier life and leads to a lower carbon footprint. By providing food from our waters, we hope to contribute to a low-carbon economy that takes care of its environment. We hope and believe that seaweed becomes part of everyone’s diet and that we come to recognise it for what it is. A superfood, both environmentally and nutritionally! FEAMAINN ORGÁNACH LÁMHBHAINTE: Rugadh agus tógadh Noel Ó Laoi i Leitir Mealláin, oileán álainn sceirdiúil amach ó chósta Iarthar na hÉireann. Leis na glúnta, tá muintir Uí Laoi ag baint Cheilpe agus Fheamainne amach ó Chósta Chonamara. ÁR MISEAN: Is é an misean atá againn ná táirgí inmharthana lámhbhainte ceilpe agus feamainne a chur ar fáil mar bhia do dhaoine trí fhorlíonta sláinte agus táirgí inite. Tá sé mar chuspóir lárnach againn i ngach ní a dhéanaimid go mbeadh tionchar dearfach againn ar ár bpobal agus ar ár dtimpeallacht. ÁR SPREAGADH: Tá sé mar aidhm againn feamainní áitiúla inite atá lámhbhainte ar bhealach inmharthana a chur ar fáil duit agus iad sin a thabhairt isteach mar fhoinse malartach bia atá sláintiúil, cothaitheach agus go maith don timpeallacht. Tá sé tábhachtach go n-aithneofaí tábhacht na feamainne don fhiadhúlra muirí, agus caithfimid é sin a chothromú leis an úsáid a bhaineann daoine as. Dá réir sin, bainimidne úsáid as cur chuige éiceachórais, rud a chiallaíonn go gcuirimid caomhnú agus úsáid inmharthana chun cinn ar bhealach atá cothrom. Tá formhór, nó iomlán, na bhfeamainní atá ar díol faoi láthair tar éis a theacht na mílte ciliméadar go dtí d’ollmhargadh nó d’ionad bia áitiúil, an bealach ar fad ón tSín ina lán cásanna. Gné ríthábhachtach do shaol níos sona is ea táirge mionscála áitiúil agus bíonn lorg carbóin níos ísle mar thoradh air. Trí bhia a chur ar fáil as ár n-uiscí, tá súil againn cur le geilleagar ísealcharbóin a thugann aire dá thimpeallacht. Tá súil againn, agus creidimid, go mbeidh feamainn ina cuid d’aiste bia gach duine agus go dtuigfimid amach anseo an mhaitheas atá inti. Sárbhia, ó thaobh timpeallachta agus cothaithe de! Connemara Organic Seaweed Company has conducted a limited biomass study in the Kilkieran Bay area to assess the abundance of various seaweeds in the area. It is our intention to always work closely with seaweed harvesters in our region to ensure that the best available information on sustainable practices is made available to harvesters and to ensure that all seaweed harvesting conducted by our suppliers is carried out in a safe, regulated, responsible and sustainable manner. Information on the biomass of seaweed in the area is critical to ensure that the resource is well managed and sustainable into the future. Our company and our suppliers are fully committed to sustainable practices throughout the supply chain from shoreline all the way to our customers. 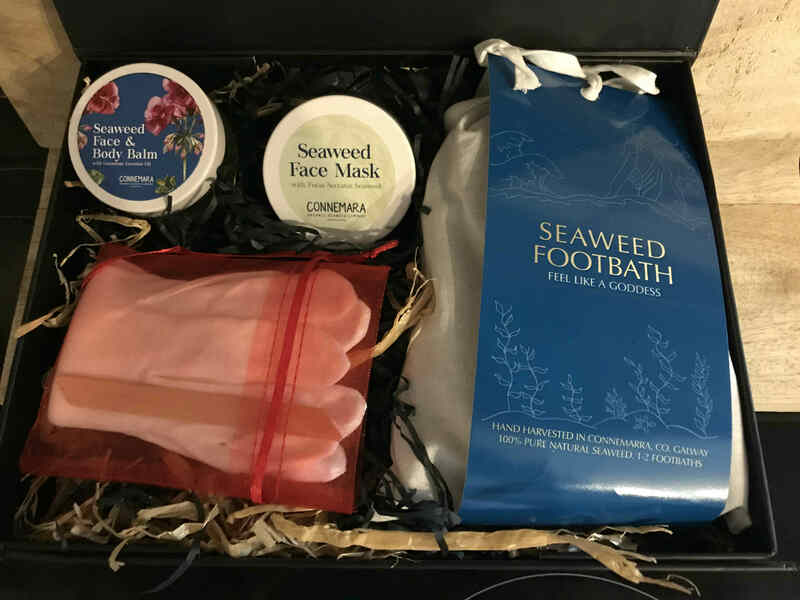 Connemara Organic Seaweed Company conducts regular testing and analysis of seaweed to ensure that it is of the highest possible quality. Connemara Organic Seaweed Company wishes to acknowledge the support of DAFM & The EMFF in part funding the project, we would also like to thank everyone who assisted with the work.